For full article, see New York Times. Before the end of 2018, Disney will flip the switch on a sprawling 50-megawatt solar power facility composed of more than a half-million solar panels, just outside Disney’s Animal Kingdom. The move is aimed, in part, at helping Disney achieve its larger plan to reduce its net greenhouse gas emissions 50 percent worldwide by 2020, compared to 2012. “At our sites around the world, we’re investing in hidden magic to continually reduce our environmental footprint,” Bob Chapek, chairman of Disney Parks, Experiences and Consumer Products, said. 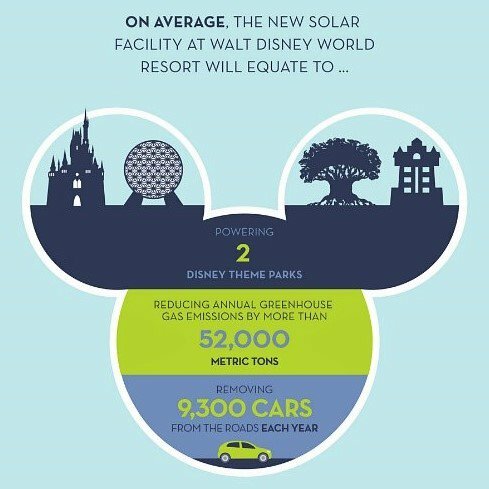 The soon-to-open Disney World solar facility, spread along a 270-acre designated renewable energy area, will produce enough energy to supply 10,000 homes annually and will reduce greenhouse gas emissions by more than 57,000 tons per year, according to Disney’s estimates. That is the annual equivalent of removing roughly 9,300 automobiles from the roads, the company says. The energy will not actually go to Disney’s theme parks, but rather into the local power grid. Nonetheless, with one eye on its global reputation and another on its customers’ increasing focus on sustainability, Disney is emerging as a renewable energy force. Disney’s move toward cleaner energy comes when brand image for global giants goes far beyond, say, merely a ride on Space Mountain — particularly among free-spending but environmentally sensitive millennials. Indeed, some 79 percent of consumers say they seek out products that are socially or environmentally responsible, according to a 2017 study by Cone Communications. “Our guests tell us the environment is important, so it’s a big deal for us,” said Mark Penning, vice president of Disney’s Animals, Science and Environment. Since it’s a big deal to guests, it is also a huge deal to Bob Iger, chief executive of Disney, who has repeatedly said that he wants Disney to be the most admired company in the world, “Not just for creating incredible content, but for being a responsible citizen of the world,” says Dr. Penning, who is a veterinarian. While some renewable energy advocates would like Disney to do even more to reduce its reliance on fossil fuels, Disney’s leadership in this area is likely to encourage others. “What Disney is doing is an important part of the trend that’s changing the nation’s grid,” says Gregory Wetstone, chief executive of the American Council on Renewable Energy. Just five years ago, very few companies were actively producing their own renewable powers, Mr. Wetstone said. But now, he said, “the most sophisticated companies are learning how to go out on their own and do it.” Of course, none can accomplish this without enlisting energy partners. Disney’s new facility in central Florida, for example, is a collaboration with the Reedy Creek Improvement District and solar project developer Origis Energy USA.